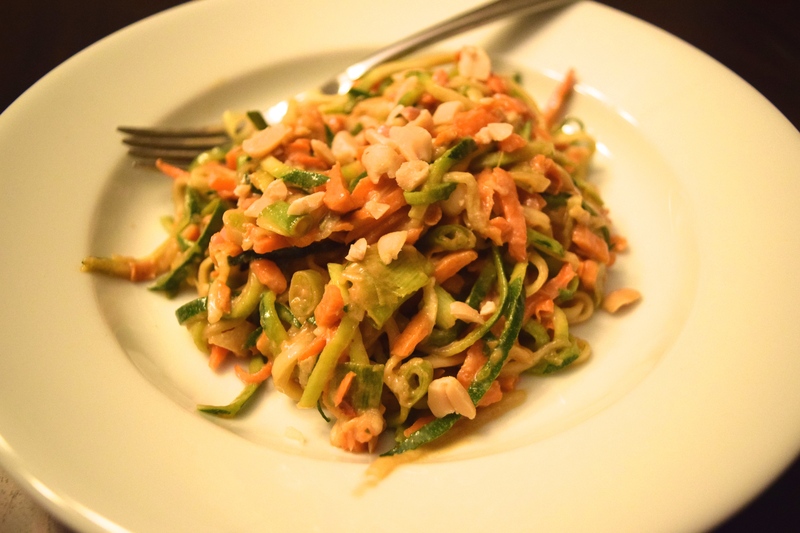 Raw Zucchini & Carrot Salad With Green Onions & Peanut Sauce. I’ve only recently become familiar with the term “zoodles” but for those of you who are not yet clued in on this, “zoodles” are made from spiralized zucchini which ends up looking like noodles. Since pasta is my ultimate favorite, I have to try anything that could provide a low-carb, healthy substitute for noodles. This dish was more of a salad than a pasta dish, but you still definitely get a little bit of the pasta feel when you’re twirling up the zoodles. 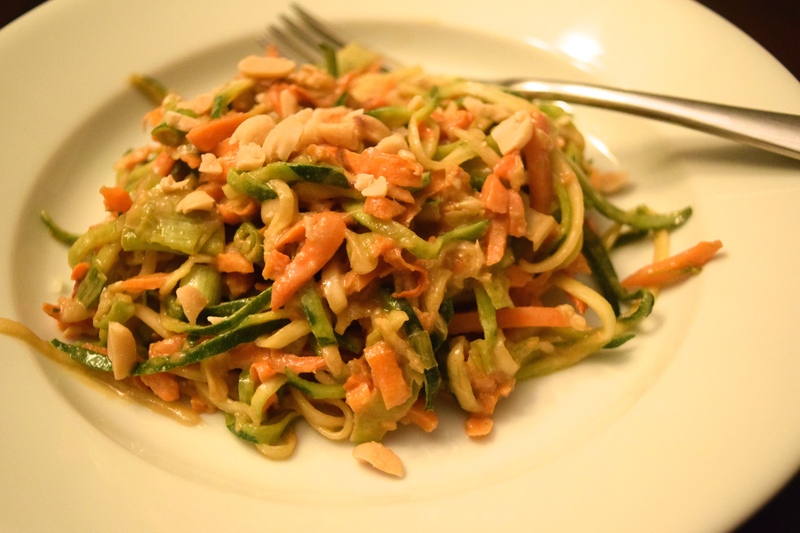 The peanut sauce is sweet, salty and a little bit spicy and goes really well with the mildness of the zucchini and carrots. It makes a great, healthy meal or side dish. If you’re a fan of peanut sauce, be sure to check on these older FBB recipes for stir-fried tofu or spicy noodles with shrimp! In a small bowl, combine the peanut butter, ginger, garlic, Tamari, rice vinegar, sesame oil and a dash of hot red pepper flakes. Whisk well to combine all ingredients and set aside. 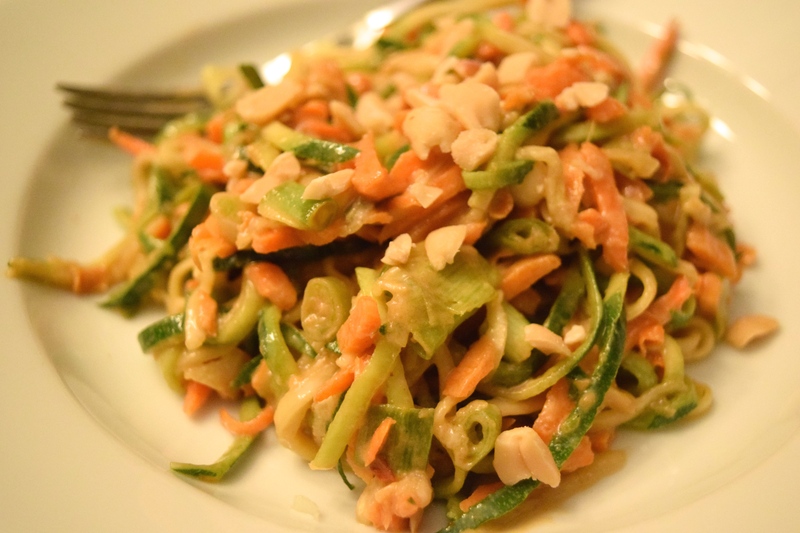 In a large mixing bowl, combine the zucchini, carrots, green onion and pour the sauce on top. 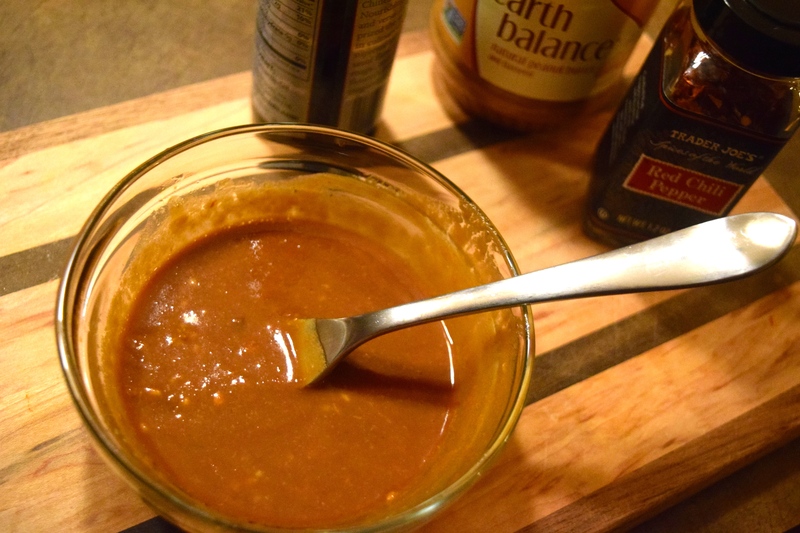 Toss to combine so everything is evenly coated in the peanut sauce. When serving, top with a small pinch of crushed peanuts for an extra crunch. ← Creamy Cauliflower & Goat Cheese Purée.